If there’s one sure thing about life, it’s that things rarely go exactly as planned. Circumstances throw a wrench into your goals and then you have to find new ways to accomplish what you set out to do. The good news is that setbacks aren’t forever. Plus, there are many ways to help you navigate even the most complex financial situations. One of those is Auto Pawn. Sometimes called vehicle title loans, this option allows you to keep all your belongings while still getting the cash you need. Best of all, there are no credit or background checks that invade your privacy. Read on to learn more about the variety of scenarios auto pawn loans can help with. It almost impossible to think of every situation where you’ll need money in a hurry. From household disasters, property damage, slip and fall accidents, and much more, even a small series of unfortunate events could quickly add up to major problems. Rather than becoming stressed or overwhelmed, it’s wise to pause and think about all the money options available to you. While you could try for a bank loan or rack up high credit debt, there are better ways to achieve your financial goals. For instance, a vehicle in good working order with a clean title in your name is an excellent way to get the cash you need in minutes. When you visit one of our three convenient locations across Volusia County, a friendly and knowledgeable team member will get right to work evaluating your vehicle and then making you the best possible loan offer. It’s just one more way we stand out from other Daytona Beach pawn shops. No one can really plan for an emergency. Even a “rainy day fund” might not be enough to cover medical expenses, lengthy hospital stays, immediate home repair, and similar. But did you know that you could be driving around in a reliable source of income right now? Since we base our loans on the condition of your vehicle, you also won’t be subject to long applications that only waste your time. Instead, the auto pawn process is simple and straight-forward. In addition, we pay the most cash for gold than any other pawn shop in the area. Plus, we’ll buy your unused or unwanted gift cards. When you’re faced with an emergency, the last thing you need is a complicated loan process. At Auto Pawn, we respect your time and privacy. 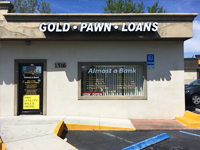 Consistently ranked as a stand-out pawn shop in DeLand, we can help you get through any financial crisis that might arise. You might already have plans for end-of-year holidays, or are saving vacation time for the new year. At some point, it’s likely that you’ll want to relax and unwind with friends and loved ones. Many people lean on credit cards while on vacation. The problem with that is you’ll have to pay off the debt along with high interest rates. Luckily, there’s a better way to get the funds you need. Simply bring in your vehicle and we’ll get started immediately creating a personalized loan tailored to your desires and requirements. 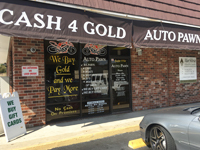 We pawn all types of vehicle makes and models, including cars, trucks, motorcycles, and boats. Not everything is about a crisis or emergency. Sometimes, you’re just looking for a safe and legal way to quickly get the cash you need. That’s when reaching out to Auto Pawn makes sense. Here, you’ll get individual attention and insight. Start the process by visiting any of our three Volusia County locations. Bring your vehicle in good working condition with a clean title in your name, and you’ll be well on your way to securing a quality loan. 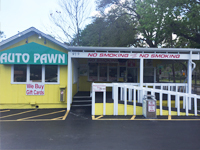 Through the years, we’ve built a solid reputation as a premier Palm Coast pawn shop. We appreciate the repeat business from our many satisfied customers. Along with vehicle title loans, we also offer the most cash for gold in the region and pay for all types of gift cards. Contact us today with all your questions. Or, simply stop by the location nearest to you.